Step by step guide to cleaning your graphics card and updating your firmware.–PC Pitstop. Don’t you hate it when your graphics card starts to freeze up and begins acting weirdly? There have been so many times when my beloved GPU – which costs a few hundred dollars – starts to perform sluggishly and becomes noisier as the fans start to work overtime. If you have encountered such situations before, follow this simple how-to guide to clean up your graphics card and update your firmware. After that, your old GPU will run like a brand new machine! Before you begin, you should collect the proper tools and know how to use them. You will need different sized screwdrivers to help with the disassembly (most modern cards use three different sizes of Phillips-head screws), plus cleaning materials such as canned air, alcohol, cotton swabs, and replacement thermal paste. I like to use a small brush to wipe away additional dust and old thermal interface material but that is optional for you. 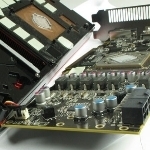 This guide is primarily applicable to AMD and NVIDIA cards made in the last 5 years. For the purpose of this how to, I will be using an AMD Radeon HD 7970 card. Some good information here for computer spring cleaning.